It is one of the most well-known speeches in American history. Today we commemorate the 50th Anniversary of Rev. Dr. Martin Luther King Jr.’s I Have a Dream Speech. As I replayed the speech this morning, I am reminded of how Dr. King had really mastered some of the best communication techniques and coordinated them beautifully to inspire, motivate, and call millions of people, of all demographics to action. Take the 17 minutes to watch this historic speech (it begins about 30 seconds in), and see if you can identify each of the techniques we’ve found that match what we teach in our workshops. Not every speech or presentation requires all of these techniques. However, failure to do any, will leave your audience feeling flat, your delivery lackluster, and your results subpar. Look at any communication designed to motivate or call an audience to action as an opportunity to try at least three techniques and practice them so your delivery is personal, powerful, and persuasive. Dr. King was successful in motivating a nation to change because he spoke to the WIIFMs of his audience in every appearance. He didn’t need big props, big movements, or big gestures. He took big messages and created a vision that was clear, full of common sense, and framed to ensure the most and least educated members of his audience could understand, follow and join his movement. Never underestimate the power of communication. It will often make the difference between where you are, and where you want to be. On a personal note, as an African-American female, Dr. King’s great communication also made the difference between where I could have been, and where I am. I continue to teach communication and inclusion, in my effort to get to where I want to be. Do you? This speech is one of the most powerful and memorable in human history. Other countries and leaders have studied not just what he said, but how he said it. Most people don’t know that it wasn’t his original speech – that one was scrapped the night before after being overworked and over-analyzed. It was Mahalia Jackson who suggested that he just “Tell ’em about the Dream, Martin.” And the rest is history. 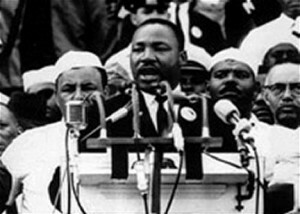 However, it takes a great deal of practice and dedication to the craft of public speaking to be able to include so many effective techniques in one speech – pretty much off the cuff, as Dr. King did. Lothery & Associates have been working with my team for a while now to incorporate these techniques into our daily external communications, and to help us develop our own style and brand. We are extremely grateful to them for the services, and highly recommend them. But if they can also get us to speak like Dr. King in this speech, we’re definitely signing up for the “bonus” package. With their help, our presentations have become memorable, but I had no idea we could become legendary.